I live in a 1 bedroom apartment, I have limited amount of storage, I don't like things (when in doubt, throw it out!) and I have a lot of hobbies. The consequence of this is that I try to make do with very little. It applies to everything from cooking with as few gadgets and appliances as possible, to using my kitchen table for sewing, baking, painting, jigsaw puzzling and, oh yes, eating. A few months ago I decided to start growing a few potted herbs on my patio. The patio is shaded all day, with the exception of a 2 hour window in one of the corners. I wasn't allowed to put any pots on top of the patio walls (which I did at first until it landed me a notice from the leasing office), so I needed a plant stand or a work bench of sort. After lots and lots of research, I couldn't find any with the dimensions I wanted, at least not without spending hundreds of dollars. I thought to myself, "maybe I should build one". 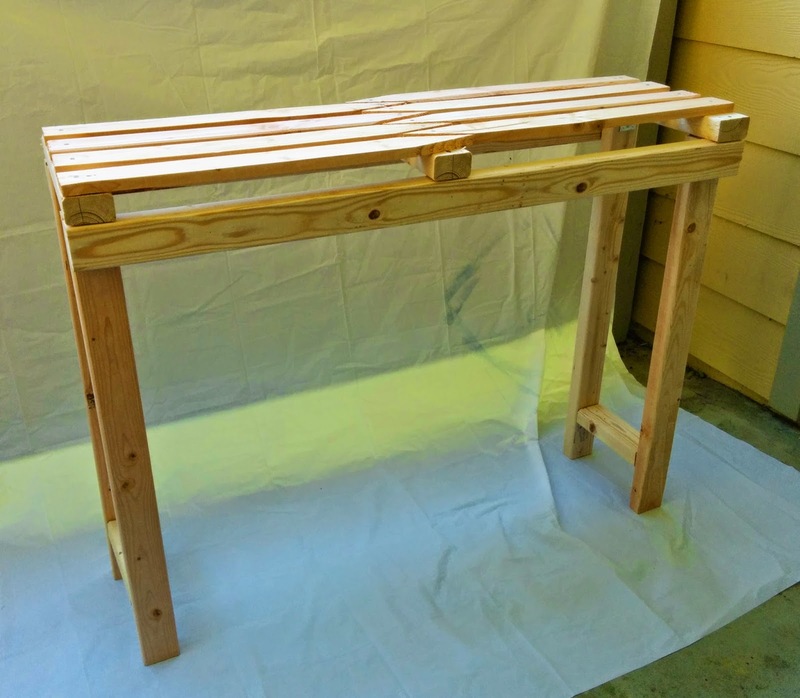 I stopped researching for products and started researching for easy DIY-projects. To my dismay, amongst the plethora of DIY plant stand manuals out there, they all required power-tools and a decent amount of workspace, of which I have none. By this point, my mind was set on building a plant stand of my own so I decided to wing it. How difficult could it be? If you would like to build your own or you're just curious how this came to be, please keep reading. 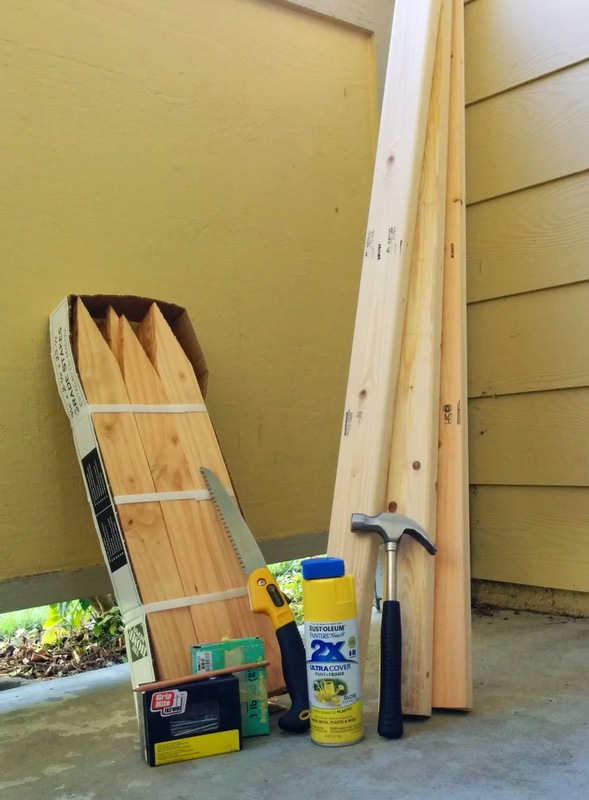 When starting this project I planned on using just a hammer and a folding saw as far as tools go. So when choosing lumber I had to consider what would be sturdy enough yet feasible to saw through. I also wanted to saw as little as possible and spend as little money as possible. 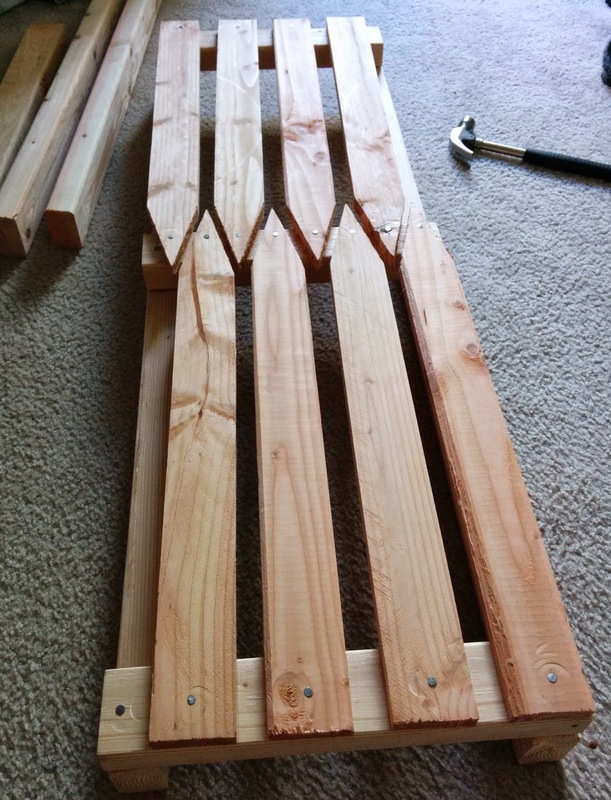 I settled on three 2x3 from which I could get two 44" pieces (frame, long side), four 32" pieces (legs), three 14" pieces (support for the lattice) and later on in the process I discovered I needed an additional two 8" pieces (leg braces). 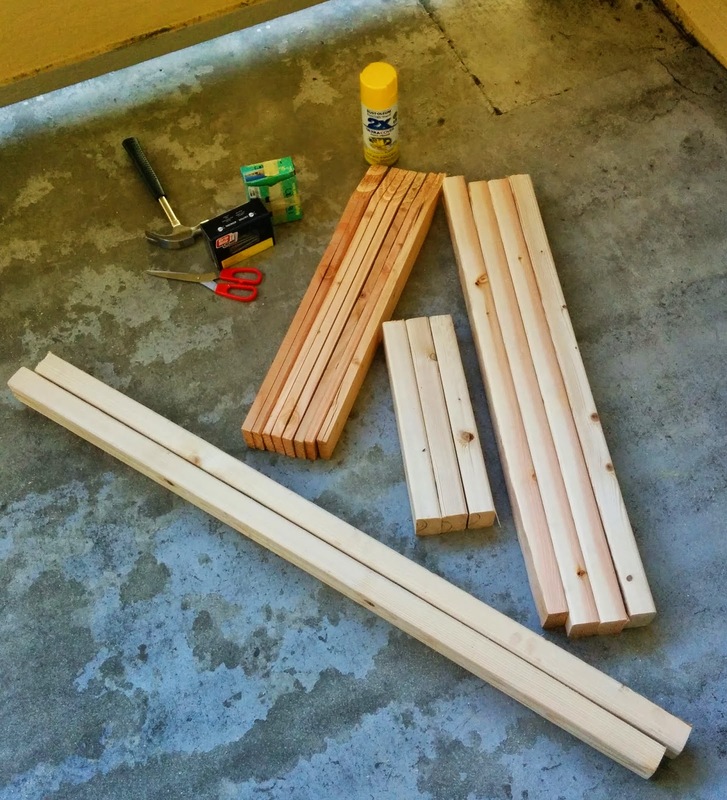 For the lattice, I bought a 12 pack of grade stakes (9/16" x 2-3/8" x 23-1/2"), of which I used eight stakes. 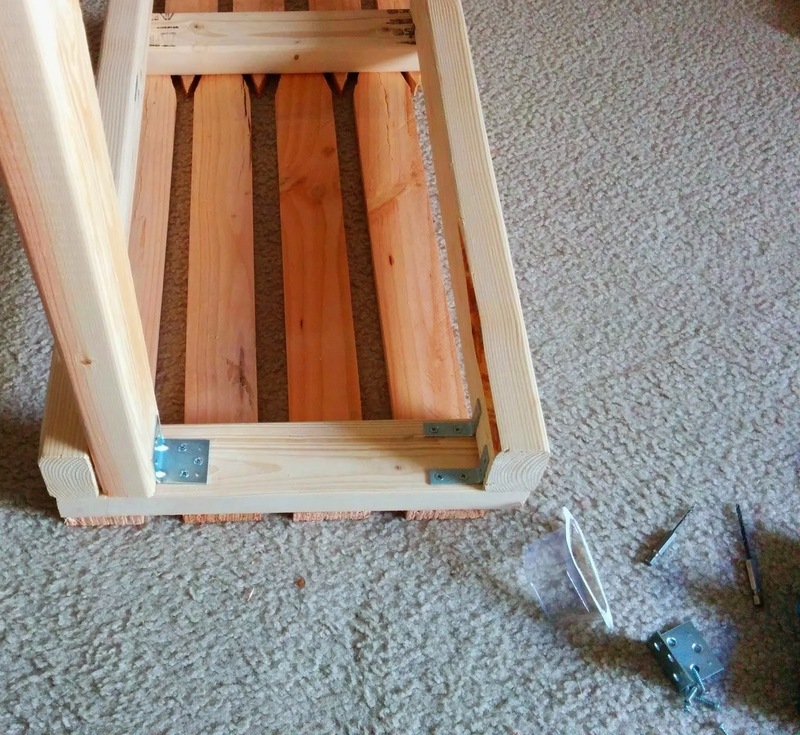 After all the pieces were cut, I assembled the frame and lattice with nails. 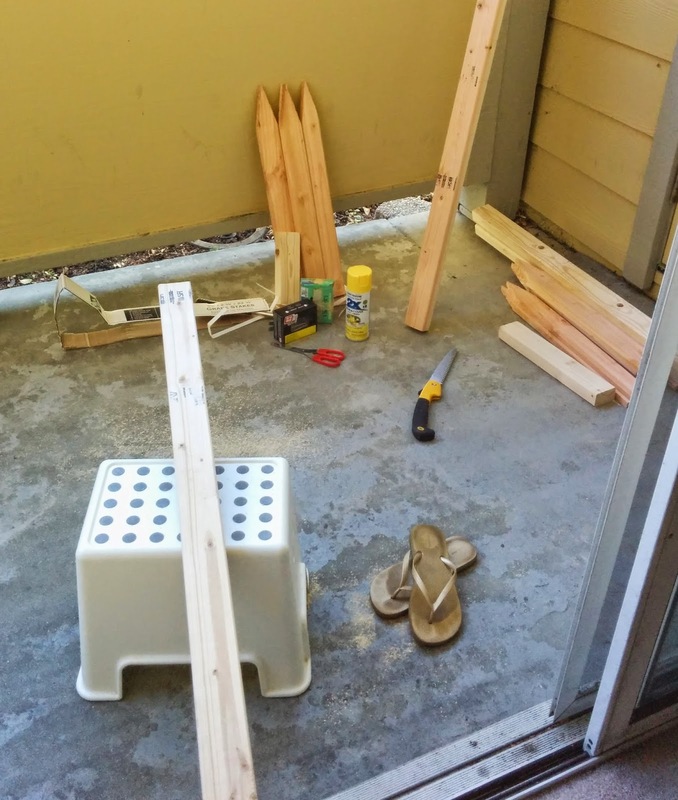 As I moved on to attach the legs to the frame, I decided to save my neighbors from the excessive noise of hammering and went back to Home Depot and bought a couple of corner braces. After a couple of attempts at screwing nails directly into the wood with a screw driver, my hands were rubbed raw and I decided to pre-drill holes. I used the drill attachment to my screw driver and went at it. When the legs were attached I noticed how much sturdier the table would be if I attached braces between the legs on the short ends. Here is where the two 8" pieces came into play. I attached them a few inches of the ground with a couple of small corner braces. After all the pieces fell into place, the only thing left was painting. 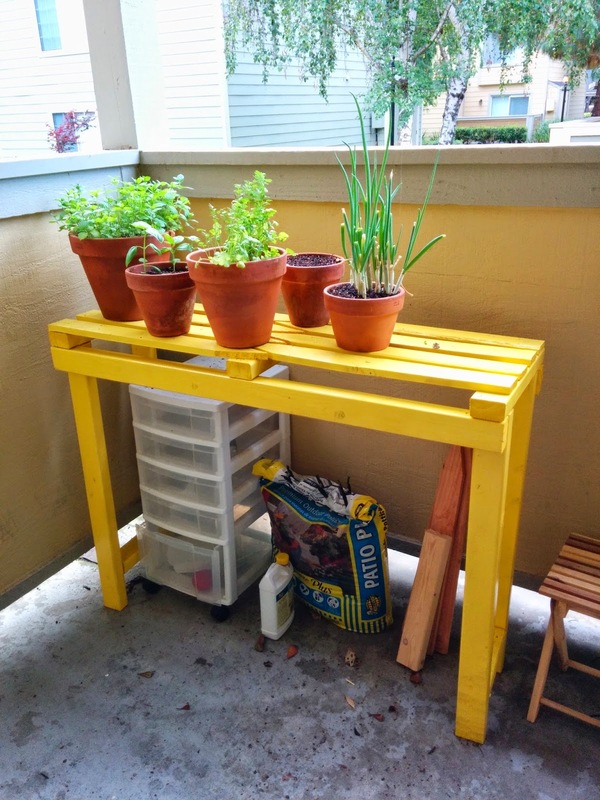 I wanted my bench to be bright yellow, so it took two cans of spray paint, with a drying in between. All in all, this project took me a couple of days to complete. I allowed a full day of drying between the two coats of paint. Also, I had to rest my hands to avoid blisters and I had to give my back and legs regular breaks from all the awkward contortions. It's the price you pay for not using a single power tool and for using your floor as a work bench. But it can be done! However, if you have access to (or decide to buy) power tools, this plant stand can be put together in a couple of hours, tops! This was a fun project, it turned out exactly as I wanted it to and it ended up costing me about 80 dollars (the spray paint ate up more than half of the budget). I've had the plant stand on my patio for a couple of months now. It's been through pouring rain as well as scorching 95 degrees. It's still sturdy and it still looks great!